Varadkar was part a panel discussion called of The New Impetus for Europe. 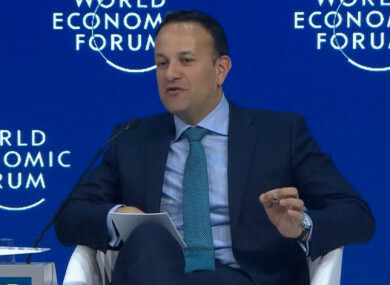 TAOISEACH LEO VARADKAR has told the World Economic Forum in Davos that Ireland has “closed down” tax loopholes and is bringing in more corporation tax as a result. Varadkar was speaking as part of a panel discussion called The New Impetus for Europe alongside the prime ministers of Poland and The Netherlands, the EU’s Trade Commissioner and an executive from Spanish multinational bank Santander. Responding to bank executive Ana Botin, who said she was against a digital tax but in favour of paying tax “where you make your profit”, Varadkar defended Ireland’s policies. “I’ve a very simple view on this, I think big companies should pay their taxes, they should pay what they owe, pay them in full and they should pay them where they are owed. And the best way we can respond to the changes in the world economy is to agree these things at an international level through the OECD,” Varadkar said. One of the things that Ireland has done in recent years, we’ve never taken more money in from corporation tax in the last year than ever in our history and part of the reason, the cause for that, is that we’ve closed down things like the double Irish,. We no longer tolerate stateless corporations, we’re forever closing loopholes that exist in our tax system. Varadkar was referencing corporation tax figures released last month which showed they were €1.5 billion ahead of target for the year to November. The Taoiseach went on to outline Ireland’s objections to a digital tax. “Our objection to a digital tax is that sales taxes like VAT fall where sales happen, profit tax are applied where profits are made, and what was proposed in the digital tax was to impose effectively a levy on turnover, and you wouldn’t apply that to car manufacturers, you wouldn’t apply that to aviation manufacturers,” he said. If you applied the same principles to aviation, Ireland through aircraft leasing and Ryanair, probably buys more aircraft than almost any of the countries in Europe, we don’t get any of Airbus and Boeing. So the principles has to be where the value is created, not where there’s turnover. Brexit was only touched upon briefly during the 30-minutes discussion and Varadkar only mentioned it to say he was surprised it was not mentioned sooner. Varadkar’s first contribution was about his recent trip to Africa and he said that Europe could do “much more” in terms of development funding for Africa and the developing world. “I think that’s something our citizens would like us to do as well,” Varadkar said. I already knew it, but you have to spend time there to fully appreciate the extent to which problems like drug trafficking, like human trafficking, illegal migration, climate change, radicalisation and terrorist risks, all of those big problems that visit us on our streets in Europe, have origins or have transit points in countries that are politically unstable, don’t have human rights and democracy, don’t have economic opportunities for their young people, and that’s an area I think we could make an enormous difference. “If western counties spent what’s being spent on a war in Syria on international development in Africa we wouldn’t have half the problems that we’re talking about now when it comes to migration and security,” he added. Email “Leo Varadkar tells Davos that Ireland has 'closed down' tax loopholes and is raking it in as a result”. Feedback on “Leo Varadkar tells Davos that Ireland has 'closed down' tax loopholes and is raking it in as a result”.